Purchased under the bequest of Captain H. B. Murray. This object came from a group of Christ and the twelve apostles, which has not been dispersed. Van Loo's works show comparisons with Rubens' paintings. Statuette, boxwood. Standing figure with curling hair and beard, the head turned slightly to the left. In his left hand he carries a large book, his right is missing. The heavy cloak is drawn over the right shoulder, across the body and held under his right forearm. The eyes are inlaid with glass beads. Inscribed in relief on the base S. Simon. Inscribed in relief on the integral base. 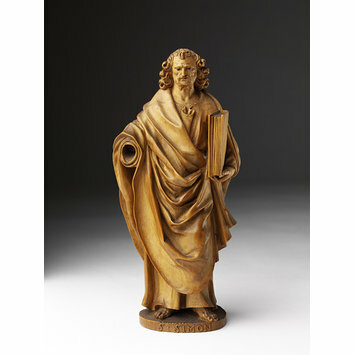 Bought with a figure of Saint Matthias from the Antique Art Galleries for £52. 10s 0d. with A.16-1932. These figures were once part of a series of twelve Apostles, with Christ. Other figures are held in several European museums and private collections. At least one other such series seems to survive from the hand of the same artist. Oldenburgh, R. 'Die Plastik im Umkreis von Rubens'. Jahrbuch dre Preuss. Kunsts. XL. 1919. p.17. cf. Bange, E.F. Doe Bildwerke des Deutschen Museums. IV. Kleinplastik. pp.109-111. Eberhaudtf, S. Bildwerke von 1600-1800. Cologne. 1996. pp.16-17. van Doorslaer, G. 'Sculptres en buis executes a Malines au XVII siecle' in Revue Belge d'Archéologie et d'Histoire de L'art. IX. 1939-1. pp.317-331. 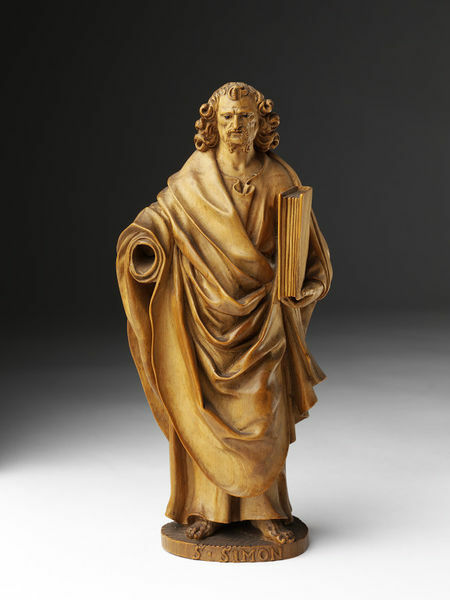 These figure originally formed part of a group of Christ and the twelve apostles.